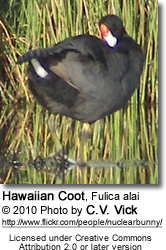 The Hawaiian Coot or ʻalae keʻokeʻo (Fulica alai) is an aquatic rail that is endemic to Hawaiʻi, where it inhabits freshwater lakes and marshes, coastal saline lagoons, and water storage areas. 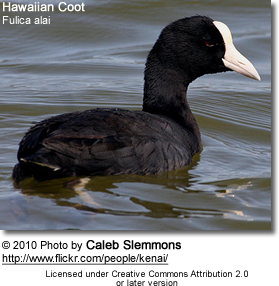 It is considered to be either a subspecies of the American Coot, Fulica americana alai, or a separate species, Fulica alai. This large rail averages 39 cm or 15 inches in length. The plumage is mostly dark slate-grey, darkest on the head. It has white undertail-feathers, which are often concealed. 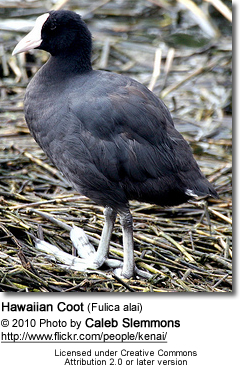 Similar Species ID: It resembles the American Coot (F. americana). However, it has smaller and dark maroon frontal shield making profile distinctly notched in the front. This coot is usually silent. On occasion, utters chicken-like keck-keck and keek notes. This species is listed as Vulnerable as throughout its range, wetlands have been destroyed by drainage for cultivation and developments. Its range is very small, its wetland habitat is scattered and limited in area, and is susceptible to stochastic events and human activities. The Makalawena Marsh on the Big Island of Hawaiʻi has been listed as a National Natural Landmark to preserve one of its last nesting areas. er each breeding season, and repair and sanitize before reusing.